This elegant but sedate 16-story, brown-brick, free-standing, rental apartment building occupies the entire western blockfront on Madison Avenue between 61st and 62nd Street. It was designed by K. B. Norton in 1950. In October, 2010, it was announced that the building, which had been recently renamed Carlton House Hotel, would close at the end of the year for a massive renovation that will result in the building becoming a residential property. In March, 2010, Angelo Gordon & Co. and partner Extell Development has purchased the 160-unit building from the Harry B. Helmsley estate for $170 million. About half of the 16-story building, at 680 Madison Ave. was already comprised of apartments, but they were to be emptied as their leases expired and the building undergoes a gut renovation. The Helmsley Estate also owns the Park Lane Hotel and the New York Helmsley. 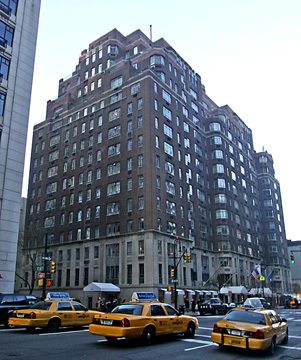 The latter had recently been put on the block, listed by CB Richard Ellis Inc., and the Park Lane will also be sold as the estate disposes of its real estate holdings. It has a three-story limestone base with handsome pilasters between the second and third floors. It has a canopied entrance, sidewalk landscaping discrete air-conditioners, several terraces and many bay windows. For several years, Maxim's, the famous Parisian restaurant, occupied a large restaurant decorated by Janko Rasic in Art Nouveau style on three levels as well as a bistro in the building on 61st Street that was notable for the large "eye" painted in the urinal bowls of its men's rooms in space that would later be occupied by Judith Lieber handbags. The building has several terraces and some bay windows. The building's site was once the residence of Velvalee Dickinson, who, according to the Federal Bureau of Investigation, "used correspondence about dolls to conceal information about U. S. Naval forces she was attempting to convey to the Japanese via South America." According to the F.B.I., she was born in 1893 in Sacramento, California, to Otto and Elizabeth Blucher, also known as Blueher, and she graduated from Stanford University in 1918 but did not receive her degree until 1937 "because of an allegation that she had not returned certain books to the University." "In 1937," the F.B.I. report continued, "Mrs. Dickenson and her husband moved to New York City, where she obtained employment as a doll saleswoman in a department store until December 31, 1937. Mrs. Dickinson then began operating her own doll store, first at her residence at 680 Madison Avenue, then at a separate store at 714 Madison Avenue. 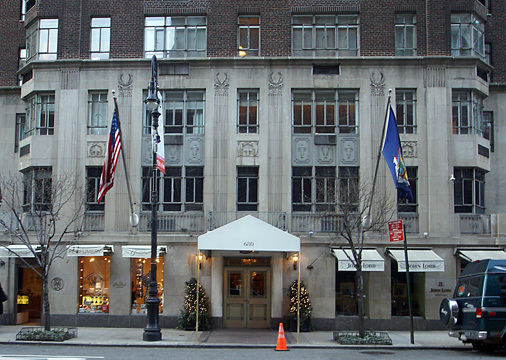 In October, 1941, she opened her store at 718 Madison Avenue, at which location she catered to wealthy doll collectors and hobbyists interested in obtaining foreign, regional, and antique dolls....The FBI's interest in Mrs. Dickinson stemmed from a letter about dolls intercepted by wartime censors because of its unusual contents and brought to the Bureau's attention in February, 1942. The letter, purportedly from a Portland, Oregon, woman to an individual in Buenos Aires, Argentina, dealt with a 'wonderful doll hospital' and observed that the writer had left her three 'Old English dolls' for repairs. Also mentioned in the letter were 'fish nets' and 'balloons.' FBI Laboratory cryptographers examined the letter and concluded that the 'three Old English dolls' probably were three warships and the doll hospital was a shipyard where repairs were made. They further concluded that the fishing nets referred to submarine nets protecting ports on the West Coast, and that the reference to balloons was intended to convey information about other defense installations on the West Coast." Four more letters addressed to the same individual in Buenos Aires "began arriving at the homes of the ostensible senders with the notation 'Address Unknown. '...The persons whose names had appeared on the envelopes as the senders stated that the signatures on the letters resembled theirs and that the letters contained correct information about their personal lives and interest in dolls. The four emphatically denied, however, that they had sent any of the letters....One of these letters, purportedly sent by a Springfield, Ohio, woman, had been postmarked New York City. The letter, also dealing with dolls, contained the words, 'Destroyed YOUR' and in the same sentence made reference to a Mr. Shaw who had been ill but would be back to work soon. Significantly, this letter was written a short time after it became known that the Destroyer Shaw, which had had its bow blown off at Pearl Harbor, was being repaired in a West Coast shipyard and would soon rejoin the fleet....FBI...examination of all five letters confirmed that the signatures on the letters were not genuine, but were forgeries which the experts decided were prepared from original signatures in the possession of the forger. The examination also showed that the typewriter used in the preparation of the letters was different in each case, but that the typing characteristics indicated that the letters were prepared by the same person....Further FBI investigation revealed that in the early and mid-1930s, while she was still in the San Francisco area, Mrs. Dickinson had been a member of the Japan-American Society. During one year, her dues to the Society were paid by an attache of the Japanese Consulate in San Francisco....The FBI also learned that after moving to New York City, Mrs. Dickinson had visited the Nippon Club and the Japan Institute, had cultivated the friendship of the Japanese Consul General there, and had met Ichirop Yokoyama, the Japanese Naval Attache from Washington, D.C....Bureau agents arrested Velvalee Dickenson on January 21, 1944, in the bank vault in which she lept her safe deposit box....FBI examination of the contents of the safe deposit box disclosed some $13,000 which was traceable to Japanese sources. A portion of the money had been in the hands of Captain Yuzo Ishikawa of the Japanese Naval Inspector's Office in New York City before coming into the possession of Mrs. Dickinson....Mrs. Dickinson said that her husband had not told her the source of the money but she believed it might have come from the Japanese Consul in New York City....She pleaded not guilty [to espionage charges, but] ...on July 28, 1944, an agreement was made between the U. S. Attorney and Mrs. Dickinson's attorney whereby the espionage and Registration Act indictments were dismissed, and Mrs. Dickinson pleaded guilty to the censorship violation, and promised to furnish information in her possession concerning Japanese intelligence activities." She spent about 7 years in a Federal prison.